Hey yall! Kinda late night post, but here's the short film "Runaway" by Kanye West for those of you who missed it, or wanted to see it again! I'm doing work in the media lab, so I didn't catch it on MTV, but I'm about to watch it right after I post this! Just wanted yall to be able to see it. Critique later...maybe. I did listen to a bit of it, heard Miss Nicki Minaj's voice with her fake me out British accent haha! I love her though! Random fact. 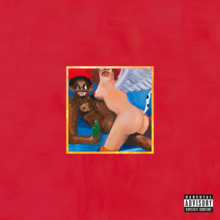 Kanye's album My Beautiful Dark Twisted Fantasy (check the interesting artwork to your left) and Nicki's Pink Friday hits stores the same day now! I didn't know Nicki changed the date on us! Interesting for two of the most highly anticipated albums to be released simultaneously. Anywaysss watch the short movie below and enjoy! Oh, and for those of you, seeking clarification, check this link!